It will be a little while before I can attend to estimates, but the Diamond charts for October have been released (story at Newsarama). Usually in October I can make a good projection as to the overall year, but 2008 versus 2007 so far is looking like a very close-run thing, so we'll have to see what the margins are in each category. 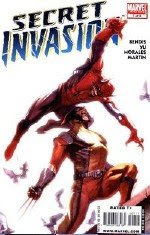 Secret Invasion #7 is the top book, meaning that the Marvel title has topped the charts for every single month of 2008 since it began. This is the longest such run in the Diamond era since Uncanny X-Men had a ten-issue run topping the charts in 1999. Civil War's run was broken up by not shipping in two months, but it also had seven issues at the #1 slot. Historically, Uncanny X-Men likely had longer runs than that at #1 in the 1980s, though further research is required to say exactly how long it went for consecutive months unbroken.